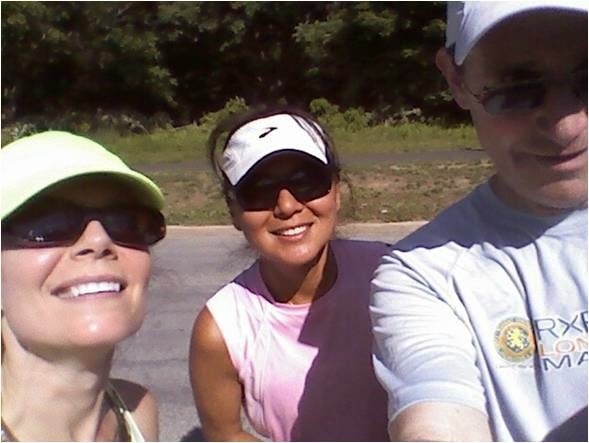 This morning I met up with my running buddies to take on Bethpage's northern bike trail. We haven't run together since the Brooklyn Half (technically, only TPP and I ran together that day), so it was fun to regroup. Now that the weather is warming up, I've been thinking that I need to carry water on longer runs. 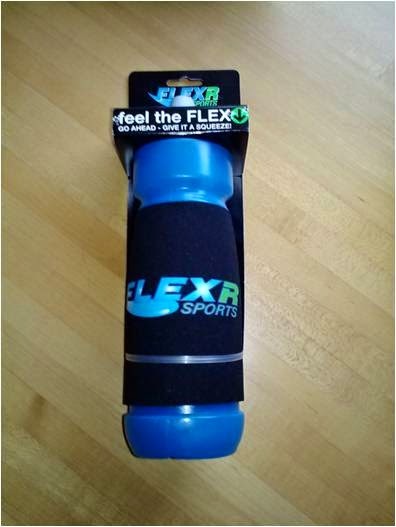 I've had little luck with running bottles, but a company called Flexr Sports had sent me one that interested me, so I decided to try it today. SIOR was waiting on the trail when I arrived at our rendezvous spot. I told her I was thinking of carrying the Flexr bottle today (she has one as well) but I was concerned about the weight (my bottle held 21 oz.) and its lack of a hand strap. I tossed it back in the car, but SIOR mentioned the rising heat, so I decided to take it along after all. TPP arrived at that moment and we quickly decided to go north. I wanted to cover six miles today, TPP was thinking 6-8 miles and SIOR, who had already run a mile, was thinking about going beyond the Cold Spring Harbor Labs publishing building. We ran together long enough to hear the details of SIOR's missing kitten saga (everything turned out fine! ), but we separated by pace soon after that. In terms of pace, mine was the slowest. That didn't discourage me, but I wished I could get closer so I could participate in the conversation. Of course, if I did push myself to their pace, I wouldn't have been able to contribute anything but gasps and grunts. My friends waited for me to catch up at the road crossings and that proved valuable for planning the next stages of our run. The last section of our route, between Washington Ave and Sunnyside Boulevard, is very hilly going north. It's so hilly that I tend to use the LIE underpass as my turnaround point instead of taking on that challenge. But the Runsketeers don't shy away from hills, so I dutifully followed them up and over. TPP has had some recent struggles with endurance and speed (as have I) but today she moved along very well. TPP and I reached Sunnyside after SIOR, who had continued on further north. We turned around at that point (3 miles) and headed back to our starting point. We knew SIOR would catch up to us eventually. Soon after we crossed Old Country Road, we were all reunited when SIOR ran into us like a freight train from behind. She is very speedy. Although both of my friends got out in front of me after that, I picked up my speed and ended up covering the last 1.2 miles in a pace range that I haven't seen in a long time. It felt great to run harder as I got to the end and I enjoyed being cheered in by my buddies who had already finished. We took our traditional selfies after that. My skill in that area seems to be getting worse. Um, how do you use a camera? 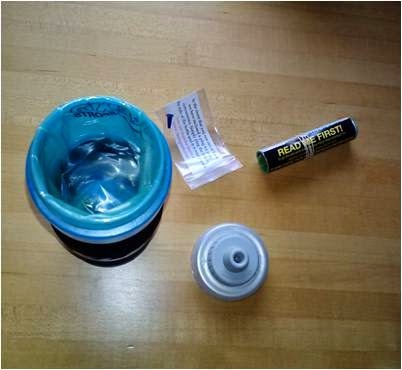 I ended up liking the Flexr bottle for its squeezable (rather than rigid) construction and its cap that worked much better than my Ultimate Direction bottle. I did wish it had a hand strap, but the shape helped make up for that somewhat. The bottle retails for about $11 and has disposible liners. I think it's a bargain. Unfortunately, I had placed the bottle on the back bumper of SIOR's car during our photo shoot and then forgot about it. Too bad, I was really starting to like it. We kept our other tradition of post run coffee at Starbucks and it was great to catch up. Soccer mom SIOR needed to leave first, but TPP and I hung in for a while and talked about running shoes and proprioception, a word I bungled badly, although TPP could pronounce it perfectly. It was a great day to run and to be with running friends. I wish I'd remembered to take my Flexr bottle, but it won't cost a lot to replace. In the meantime, I'm pleased with my progress. I didn't run fast, but I was faster than yesterday. As long as things keep going in that direction, I'm okay. Speed work soon. I think that's the only way to return to past performance levels. You can have mine. Fun run, good pace for you, and successful picture taking. We all have chins! No love for the Flexr, huh? I agree - lots of fun and good running. Six miles goes by a lot faster with you guys.